Sea turtles have existed in the world’s oceans for millions of years. Sadly, these ancient reptiles are in danger of extinction due to harvesting, coastal development, capture in fishing gear, habitat destruction and marine pollution. You can help sea turtles by observing nesting turtles. Watching a sea turtle lay her eggs into the sand is an unforgettable experience. However, if startled, she may return to sea before successfully completing her nesting effort. Minimize disturbances; stay quiet and move slowly. Do not approach a turtle as she crawls from the sea. Turtles that have not laid their eggs should be left alone; they are easily frightened off. For your own safety, stay away from the head region. Turtles have very strong jaws! If a turtle is in the egg laying process, approach slowly and watch quietly from a distance; move away if the turtle shows signs of stress. Do not disturb turtle eggs or hatchlings. 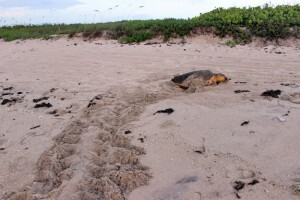 Do not disturb tracks left on the beach; researchers use them to identify nesting sites. 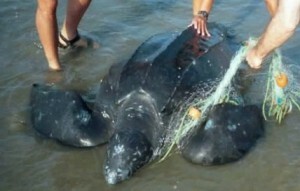 Want to go above and beyond to help the turtles? Consider adopting one.